The calorie content of barbecued ribs varies based on whether the ribs are pork or beef, and the cut of the meat. The primary nutritional concern regarding barbecued ribs are calories and fat content, particularly of the saturated variety. The calories can quickly add up, so portion control is essential. A serving, or 3 ounces, of barbecued pork ribs contains 222 calories. 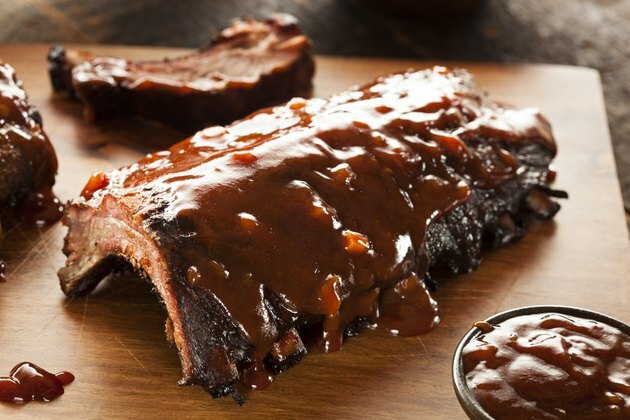 A serving, or 3 ounces, of beef baby back ribs contains 306 calories. A serving, or 3 ounces, of beef short ribs has 212 calories. Barbecued ribs have a high amount of saturated fat. Pork ribs are 20 percent saturated fat; beef baby back ribs are 32 percent; and beef short ribs are 25 percent saturated fat. Eating a lot of saturated fat is linked to heart disease, so less than 10 percent of your daily intake should be from saturated fat.